Here's one that fell through the cracks. The Red Strings Club [GOG, Steam], a cyberpunk adventure game from Deconstructeam recently released with Linux support. libc6:i386 libasound2:i386 libasound2-data:i386 libasound2-plugins:i386 libcurl3:i386 libgtk2.0-0:i386 libopenal1:i386 libglu1:i386 and dependencies. The game doesn't pull its punches, with the game starting off with a character falling to their death, before it quickly flashes back in time. Here, we are introduced to the main characters as a busted android suddenly falls into the club and here the meaty cyberpunk story really starts. It's a bit of a strange experience, a little like VA-11 Hall-A at times with the bartender theme. In the case of The Red Strings Club, you're playing as Donovan, a information broker/bartender who has some ability to read into the soul of your customers to pour the perfect drink. Although, you're not playing the game entirely as this character, as you go through scenes with others too. The drink mini-game is actually quite amusing, as you try to mix in different spirits and ice cubes to match the mood of a person. I don't think I should be a bartender though, because damn I made a huge mess every single time. The type of drink you serve, will result in a different response from the customer. So it all depends on what you want them to chat about and it's a pretty fun system. Once you get into a conversation, you might want information about a different subject, requiring you to serve up a different drink to play on their mood. There's other mini-games too, like a pottery game where you craft implants for humans looking to upgrade themselves. Although, I'll be honest I wasn't a huge fan of that part of the game, as I found it a little too tedious. I felt like it overstayed its welcome at the start, the interface was quite annoying with you picking little tools, repeatedly left clicking to spin the object and then attempting to grind it down into the required shape. I felt the controls were too floaty and I just didn't enjoy that aspect of the game. It deals with a number of interesting themes like morality, ethics, AI sentience and what powerful corporations will get up to in the distant future—nothing good obviously. It was quite interesting to see the outcome of some things I did as I progressed through the game, some of it was done rather nicely and I honestly didn't expect the choices I had made to come up as they did. I will say this, some of the conversations I had did make me think again about the world now and how it could be different with some specific things I won't spoil. 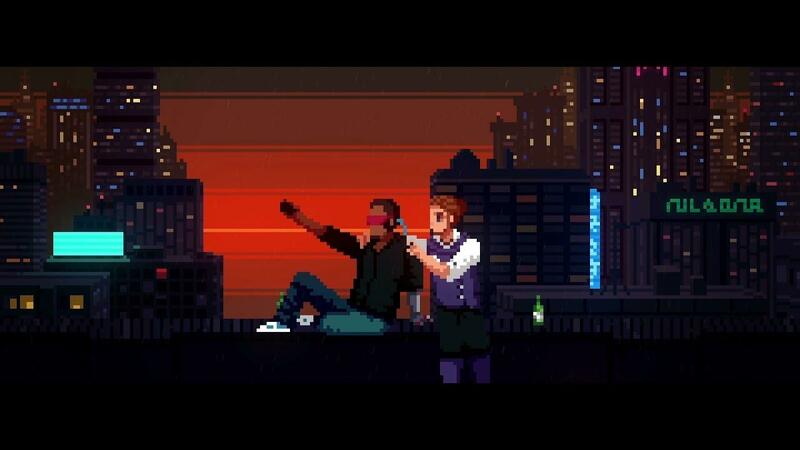 Overall it was an interesting game, with some lovely music and fantastic artwork where the cyberpunk theme shines. You can grab it now on GOG or Steam. Just finished this game, and it's a very good one! Short (about 3 ~ 4 hours) but excellent graphics, sounds, music, story and mechanics (not that much gameplay as you mainly follow a branching story through dialogs, but small games well integrated in the story give a good rhythm and balance to the game)!